The cast iron bath at the moment there are no competitors – it perfectly keeps heat, does not make noise, it is very difficult to deform. However, like any other sanitary appliance, it has a period of operation, after which the appearance of the bath is poor. The complexity of removing and replacing cast iron bathtubs, high cost of new - all this forces to seek a compromise. The best upgrade option is the restoration of the enamel. When selecting a enamel try not to skimp. Despite the fact that the domestic industry produces a good apogonidae enamel apolin and epoxy, the best performance characteristics have Finnish, for example, Tikkurilla. Take not 1 but 2 sets. To give a bath any color buy color. However, remember that 1 times the color will not fall exactly, so you'll have to take stock. Prepare the bath: it is necessary to degrease the surface to give roughness to the old and the new cover had the largest contact area. Degrease should be 2 times – before treatment and after a sander, before applying the enamel. Use the type of Sanita to clean plates or toilet cleaning type "Sanoks", which contains the Builder of fat. After degreasing thoroughly wash the surface. To make the surface of the bath is rough, use a grinder, a sander, or abrasive block. All chips and cracks expand to the same instrument. Walk throughout the area with kordecki. Rinse off all the dust, clean the tub again, wait until dry. Remove from the bath, all the seals, remove the drain and overflow. Must remain only a metal housing with which you and will continue to work. Vacuum cleaner absorb dust. Under the tub lay the newspaper in the tank a sufficient amount of dilute enamel, mixing both components (only 1 set). 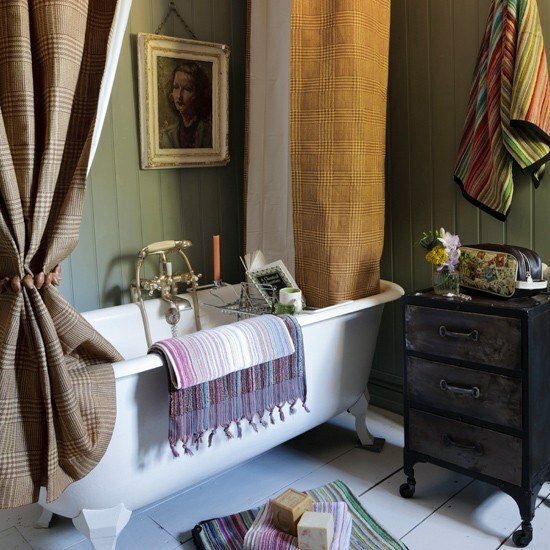 Dip the brush into the composition and apply a thin layer starting from the edges of the bath, move to the bottom. This primer layer, align horizontal and vertical movements, alternating between them. The second and subsequent layers are applied similarly. Do not wait for drying of the previous layer. Work the sides of the bath. Spread the second set of enamel and work on the same principle. A uniform layer can be checked by swiping a brush over the surface – if it always glides smoothly, you've done a good job. After 15 minutes, remove the streaks, smearing the brush from the bottom up. Inspect the cover periodically every 15-20 minutes up until it will not cease to form streaks. Allow tub to stand for 4 days to new coverage is firmly to the old village and completely hardened. After this time the bathroom you can use.